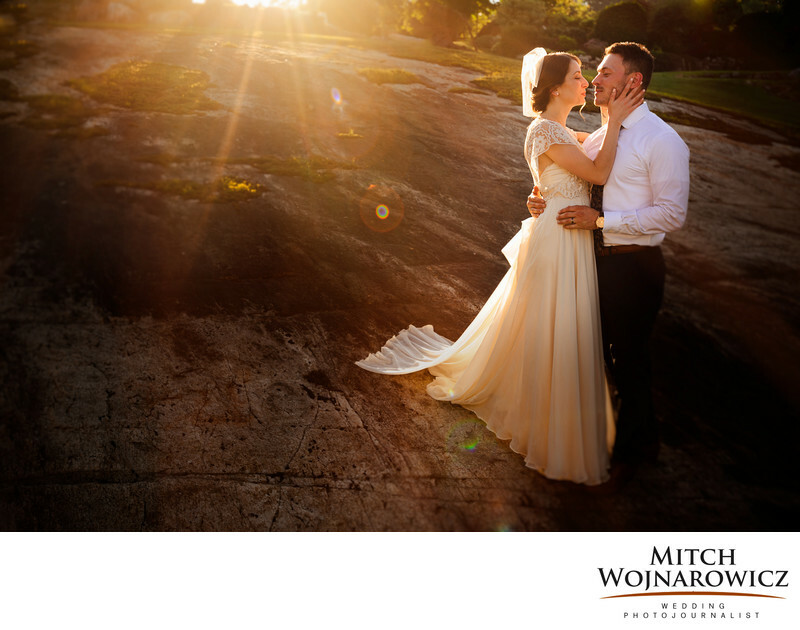 In the late afternoon light, in a spot you might overlook for a Lake George wedding photo, Georgia and Jeremy share a quiet moment together. Taking a brief step outside of their Boathouse wedding on Lake George was all it took. Often, it is great for a couple to take a brief 10 minute break from their wedding reception and come along with me for some relaxed wedding portraits. Knowing the details of the wedding day intimately, as I do at every wedding, I knew right when the sun would begin to drop behind the Adirondack Mountains, creating great lighting for a great wedding image. The photo is natural. The sunlight streams in. A false composite image can’t capture what your wedding day really looked and felt like. And this photo ended up as a large 2 page image in their modern wedding album and is a photo which I love. Posing a wedding couple is often done in a way that many wedding photographers learn from a book. It results in un natural and often awkward photos, ones which don’t hold much meaning for the couple after the wedding. A better way is the way I pose wedding couples, coupled with my wedding photojournalist’s instincts. It results in a natural setting, a natural and comfortable way of standing where I coax out the personality of each and every couple so that they may look at their wedding photos years later and will truly feel that the photo is “them”. Wedding photos which reflect who you really are as people and aren’t rooted in artifice or vanity, or some posing template, will be the ones which end up on your walls and in your life. Speak With A Different Lake George Wedding Photographer Today! I’d love to speak with you about your Lake George wedding and would be happy to show you many more photos from wedding at The Boathouse. Don’t worry, there’s no obligation and you won’t be bothered with a sales pitch, with lots of follow up emails or a ton of unwanted calls. So Go Ahead And Contact Me Today to see if we’d be a great team for your wedding! Location: The Boathouse Lake George.